Mother's day in T minus 6 days! Breakfast in bed and a romantic French bouquet...what could be a better gift for Mother's day this year on the 13th of May? 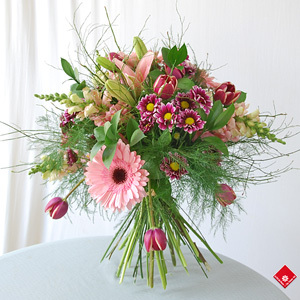 Pretty garden flowers like lilies, snapdragons, gerberas, daisies, and tulips are hand-tied together, European style, to make a natural, pastel-coloured spring bouquet. The idea of a French bouquet is to set the flowers in such a way that the bouquet can stand on its own. The flowers are organized into a spiral, creating an even, rounded top (blooms), and a wide, even bottom (stems). The added greenery and variety of the flowers give this arrangement a whimsical quality that is sure to be appreciated. If the French bouquet sounds a little too high maintenance to you, we can suggest a floral arrangement that would be perfect for today's modern mom-on-the-go. For example, our "colorful flowers in a cube" is a compact bouquet filled with the vibrant colours of orange gerberas, roses, and spray roses.